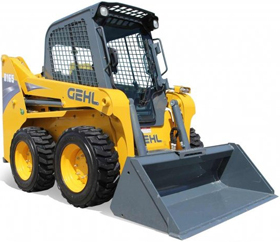 Just like it’s sister products in the R series, the GEHL R165 lives up to its expectations. The operator was kept in mind to create the easiest user experience. Besides the ease-of-use, the lifting capabilities reach new limits with the newly designed hydraulic system. This Skid Loader will live up to all expectations. 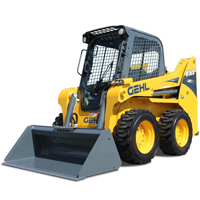 Skid Loaders can be used for a various of different projects. These projects can be as small as digging up a new garden in the yard or bigger such as construction work on a road. New, redesigned operator area with spacious entry, enhanced controls, digital display, improved visibility and unsurpassed creature comforts. Tier IV emissions compliant Yanmar engines. Enhanced hydraulic performance with improved cycle times, increased auxiliary flow and impressive breakout forces. Compact frame and proven radial lift boom design. Thumb-controlled, fully proportionate auxiliary control switch is located on the control grip in all control configurations. Relief under pressure coupler block makes attachment changes simple and quick. Rated Operating Capacity: 1,650 lbs. Rated Operating Capacity w/Optional Counterweight: 1,800 lbs. Operating Weight, Approximate: 6,165 lbs.